MySQL Enterprise Firewall is an extension included in MySQL Enterprise Edition, a commercial product. To learn more about commercial products, see https://www.mysql.com/products/. MySQL Enterprise Edition includes MySQL Enterprise Firewall, an application-level firewall that enables database administrators to permit or deny SQL statement execution based on matching against whitelists of accepted statement patterns. This helps harden MySQL Server against attacks such as SQL injection or attempts to exploit applications by using them outside of their legitimate query workload characteristics. Each MySQL account registered with the firewall has its own statement whitelist, enabling protection to be tailored per account. For a given account, the firewall can operate in recording, protecting, or detecting mode, for training in the accepted statement patterns, active protection against unacceptable statements, or passive detection of unacceptable statements. The diagram illustrates how the firewall processes incoming statements in each mode. 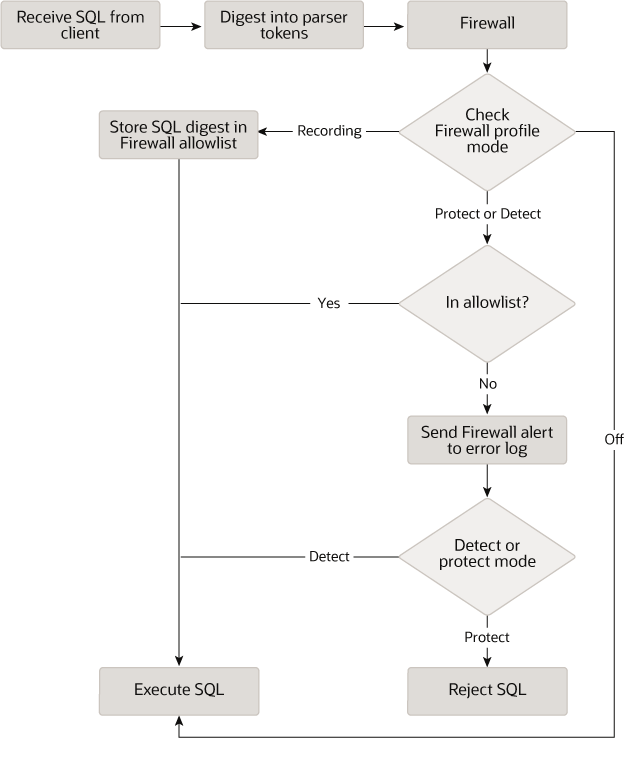 The following sections describe the components of MySQL Enterprise Firewall, discuss how to install and use it, and provide reference information for its components.